Cassini view of Rhea's anti-Saturnian hemisphere, showing the moon's two largest impact basins (Mamaldi above and left of center, and adjacent Tirawa to its upper right). At highest resolution, several long linear features are visible: halfway down from center is Harahvaiti Fossa, while near the limb left of the bottom is Koykamou Catena. 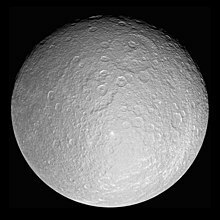 Rhea (/ˈriːə/;[a] Ancient Greek: Ῥέᾱ) is Saturn's second largest moon. It is made of ice and rock. Rhea may have a thin ring system with three narrow bands in a disk of solid particles. These would be the first rings seen around a moon. The discovery was announced in the journal Science on March 6, 2008. ↑ In US dictionary transcription, US dict: rē′·ə. Wikimedia Commons has media related to Rhea. ↑ Observatorio ARVAL (April 15, 2007). "Classic Satellites of the Solar System". Observatorio ARVAL. Retrieved 2011-12-17. This page was last changed on 13 August 2018, at 17:10.